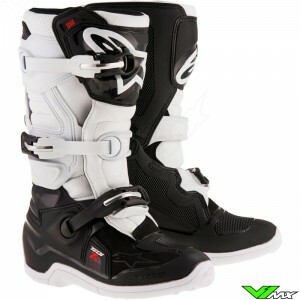 V1mx has a wide range of motocross boots from top brands such as: Alpinestars, Gaerne and Sidi. Check out the current range of boots below. 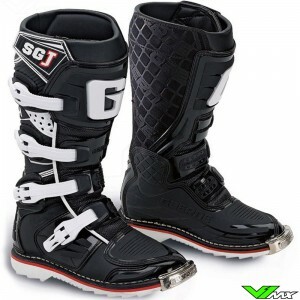 Why are good motocross boots important? 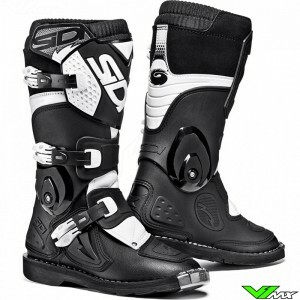 Boots are an important part of a motocross gear kit because it provides protection of the foot, ankle and lower leg, but is also an important connection with the dirtbike. When driving on a dirtbike it’s important that you have freedom of movement, to make sure you can move back and forth. 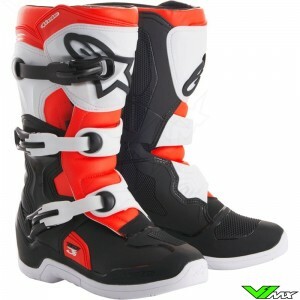 The most advanced kids motocross boots have a hinge point. This hinge point allows the children to move their bodyweight backwards and forwards without spending too much energy. In addition a stop is build-in to prevent the ankle from bending too far. 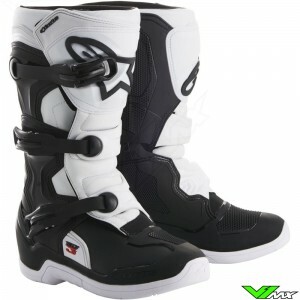 Youth motocross boots have made many revolutions over the years when it comes to protection, fit and comfort. An example of these are the buckles with memory. These buckles are developed so that the boot is strongly strapped around the foot. The built-in memory system, makes sure the boots will have a constant fit. In addition, much progress has been made with new materials and design techniques. 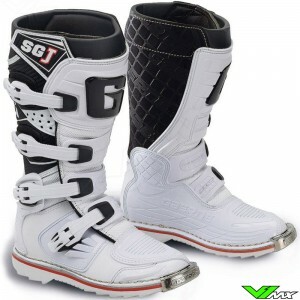 Through the current technology with computes such as simulations and calculations, youth motocross boots are increasingly well-thought out. For example, the boots are specifically designed to provide flexibility in certain areas while using reinforcement and protective materials in other areas. In most cases choosing the shoe size or one size larger will offer a good fit. 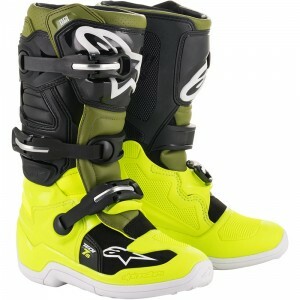 If the motocross boots don’t fit you can return or exchange for another size. We have a 30 day return policy, so you have plenty of time to try out the new mx boots. V1mx has a wide range of the big brands available. 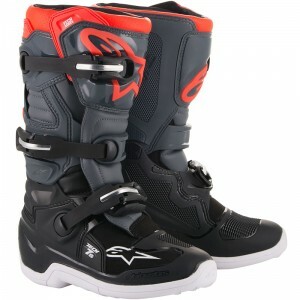 Alpinestars Kids Boots are available in many versions and colors. The Italian brand has 2 models available for young racers. The most advanced model is the Alpinestars tech 7s. The tech 7s has the same technical features as the professional tech 7, but has adapted proportions and ergonomic fit for the sizes of children. The tech 7s is equipped with a hinge point and a blade system. The hinge point ensures freedom of movement and the blade system prevents over extension of the foot. Furthermore, these children’s boots are made with TPU reinforcements for extra protection and different grip panels are provided. The grip panels are applied to the toe area for extra grip on the gear pedal. More information about the Tech 7s can be found in the product description. 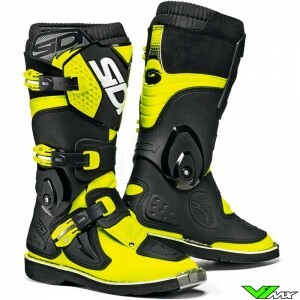 An alternative are the Sidi kids motocross boots. They produce the Flame model which is known for its great performance focus features, such as the hinge point, light weight and high quality materials. Also check out the Gaerne youth boots. Their model called the SG-J is available in many colors. The SG-J provides excellent protection and performance. 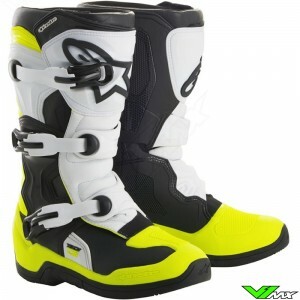 Do you have a question about the Kids Motocross Boots? Feel free to contact V1mx, we will gladly help you to find the right motocross gear for children. 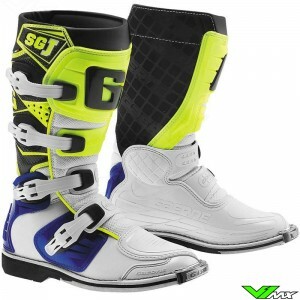 Besides protection, fit and comfort of the modern youth motocross boots, they also look cooler. 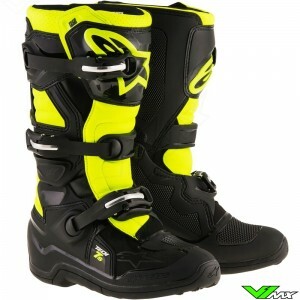 With a wide choice of colors and models, V1mx has mx boots available for every child.